Last month we hosted Fintech Central with our good friends at Nasdaq in New York City. 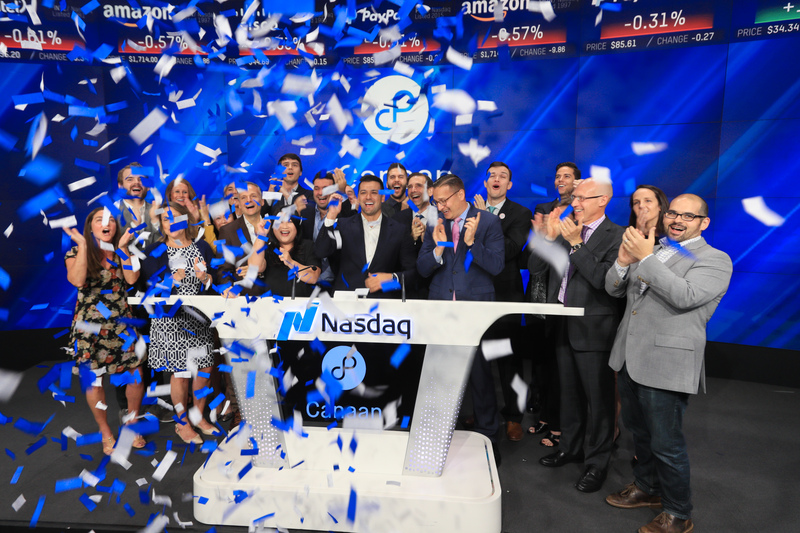 In addition to a fascinating panel on Thursday night, we rang the opening bell Friday morning to celebrate our longtime partnership with Nasdaq. Thank you again to Joe Brantuk, Nelson Griggs and Kim Hartmann for hosting us for a day we’ll never forget. Our Fintech Central panel this quarter featured three very important players at the infrastructure layer of the crypto community: Nasdaq’s Head of Crypto and North American Equities Tal Cohen; CME’s Tim McCourt, who launched their Ether-Dollar and Bitcoin Reference Rate products; and Coinbase’s Kayvon Pirestani, who has played a key role in developing the relationships and products for institutional investors in the crypto markets. Each panelist brought something unique to the discussion: Nasdaq as one of the first true fintechs in the world with more experience in the stock exchange business than any other market participant; CME Group as the leading and most diverse derivatives marketplace, which ultimately drives liquidity and defines market maturity; and Coinbase, the undisputed winner thus far in pure-play crypto exchanges. Secure custody: Coinbase recently took a massive step in the right direction by adding to their institutional services with Coinbase Custody, a service that offers, amongst other things, on-chain segregation of crypto assets, split/offline private keys and cold storage auditing/reporting. Access to margin: In addition to secure custody -- which is table stakes in every other financial market -- large funds will need access to margin, which today is inherently challenging to price. Regulation environment: Knowing that regulations are in a good place and traders are inherently safe trading this asset class is crucial for more institutional participation. Crypto assets are unique and somewhat similar to the FX market in that the market trades 24 hours a day, 7 days a week, 365 days a year and across every single geography (whether local regulators like it or not). This creates a structural need for exchanges and regulators to work together in a truly interrelated way. Today, this doesn’t work very well with traditional asset classes like equities and debt, where a majority of the time securities are unavailable to individuals in different geographies. Ultimately, the panel felt like this challenge calls for deep KYC on all market participants in addition to unprecedented coordination and communication by international regulators. When this happens, the spot, ETF and futures markets can come together to form a liquidity pool where risk can be freely transferred among participants. Unsurprisingly, the topic of the regulator continued and was central to the discussion. Tal noted that RegTech is under a boom and a bit of a renaissance. He argued that the regulator will ultimately find that data on the blockchain is easier to follow and the tide will turn when we start exposing all of that data to the public. Tim followed with the point that market participants at the infrastructure layer are best suited to work with the regulator to find a way to maintain innovation while also offering products to the market that are efficient, fair and trusted. While there is a lot of action in applications across the broader market sector today, it is clear that our path forward is dependent on the backbone of the industry that is represented by the products offered by folks like NASDAQ, CME and Coinbase. We’re well on our way and are hopeful that regulators will remain open to innovation while creating laws that protect consumers and investors. Thank you again to Tal, Tim and Kayvon for your time and participation.